It could be a pile of books to read, it could be a pile of deaccessions! I had a big weed today. Oo-er: careful how you read that! A big weed. A big deaccession. 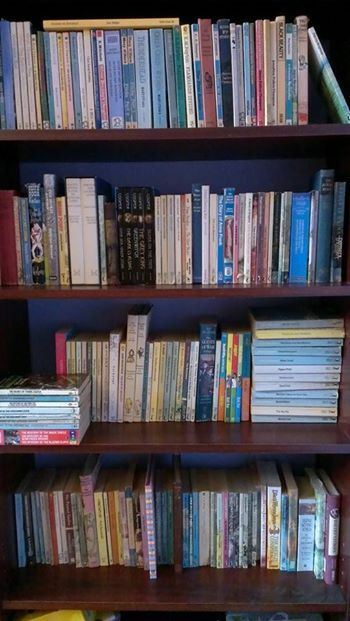 Out of a shelf of books and my travel section, I have about 20 to join the reshelved children’s books section in the guest room, and about 20 to go off into the world via BookCrossing. Added to the Biography weed I had a few weeks ago, and the great Wendy Perriam chuck-out of early January, that’s about 50-60 books off the shelves. While I would like to say that that’s 50-60 books I can ADD to the shelves in the future, it’s more like the piles of books in front of their relevant sections can move onto the shelves, the sports books are all shelved vertically and Social History, Villages and Books About Running a Hotel have their own tidy section. There are a few gaps, though. Why all this weeding? I blame (thank) the Month of Re-Reading that I do every January and July. OK, it slows up my TBR demolition, but planning my re-reading and then doing it has made me focus on what books I keep. 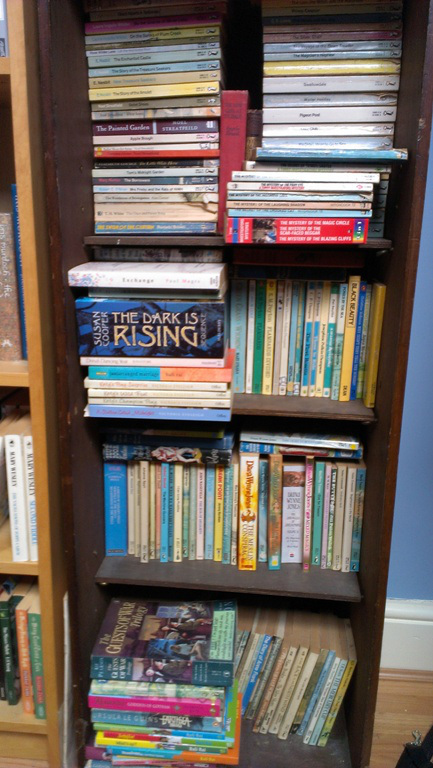 Before Bookcrossing, I used to keep pretty well everything, unless it was utterly rubbish. I discovered Bookcrossing when I came to move up to Birmingham with Matthew, realised that about 80 books had languished in my storage unit unread and unwanted for a couple of years and was looking for creative ways to pass them on, and since then, I’ve been pretty good at not keeping anything that I wasn’t likely to re-read in the future. However, that left books purchased before 2004 (i.e. Before Bookcrossing), plus ones that I thought I might want to re-read in the future. Going through picking books to add to the Month of Re-Reading has really seemed to focus my mind on what I do want to read again, and has made me less anxious about getting rid of books I won’t read again. Sometimes, re-reading a book to check whether I still like that author has led to deaccessions – but not as many as these latest culls have produced. The mind works in a funny way, doesn’t it, and I note that it was when I was popping downstairs for a work break drink that I suddenly found myself picking books off the travel section and making a pile to give away, rather than in early January when I was picking re-reads. But, whatever: it’s another reason why I’ll be continuing those Months of Re-reading! Have you done some deaccessioning recently? How has it felt? Do you find it easy to pass books along? Well, I’ve been a busy lady and have had to save this state of the TBR post for the second day of the month, as I spent yesterday talking about my Top Reads of 2013 and my planned book challenge for 2014 and beyond. I’ve also renamed this blog as I feel it’s more about the reading and writing and less about reports from the front line of self-employment, so reflects the blog better. AND I’ve added a blogroll in the right-hand column which pulls together the best book review blogs that I read on a regular basis. I was looking at everyone else’s blogrolls, thinking this blog wasn’t on them, thinking this blog didn’t have a very suitable name to be on such lists, and thinking that I should do my own list … and it all came together into a bit of housekeeping! 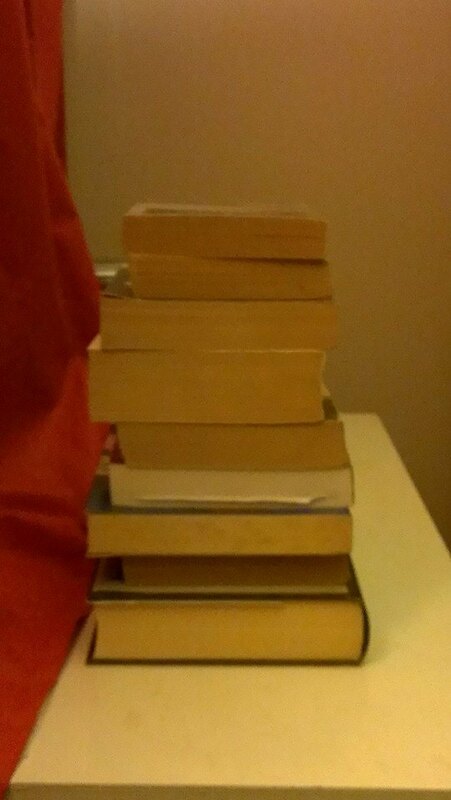 Here’s the TBR as it is now (above), with my Christmas books added. Not too bad, actually! Only one of the Christmas books went into A Month of Re-Reading in January, but I’d done sterling work getting through some good reads in December, so plenty of room. 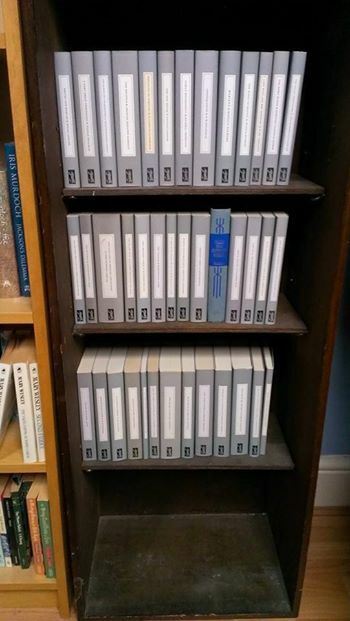 If you can’t see it clearly, the Virago to the right of the tall grey book is the last one on the front row. Of course, not only did I add Christmas acquisitions from the BookCrossing Christmas meal and Christmas Day itself; I also received an extra book on 31st December – a gift from one of my Russian clients, sent via Amazon. 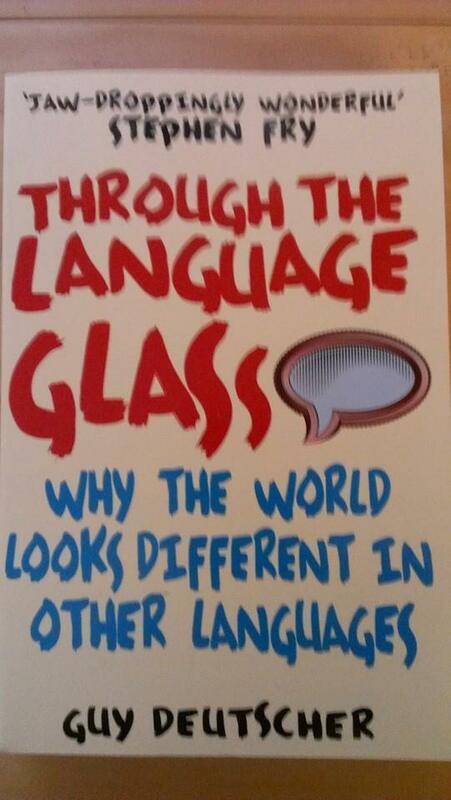 And such a good book, which I hadn’t heard about before but which would definitely be on my wish list if I had. Hooray! As has become customary, since July 2012, I’ve been doing a Month of Re-Reading every July and January. I’ve really, really enjoyed revisiting some old friends, checking that I want to keep the authors and genres that I’ve been keeping all these years, and seeing whether my opinion of books changes over the years (I have paper reading journals going back to 1997 and can remember what I thought about a lot of my favourites earlier than that). I feel it’s a valid and worthwhile thing for me to do, stepping off the conveyor belt of the To Be Read pile and enjoying some different reads from around my shelves. Winifred Holtby – “The Crowded Street” – received for Christmas in the Persephone edition but I know that I’ve read it before so off the TBR and onto the January pile! 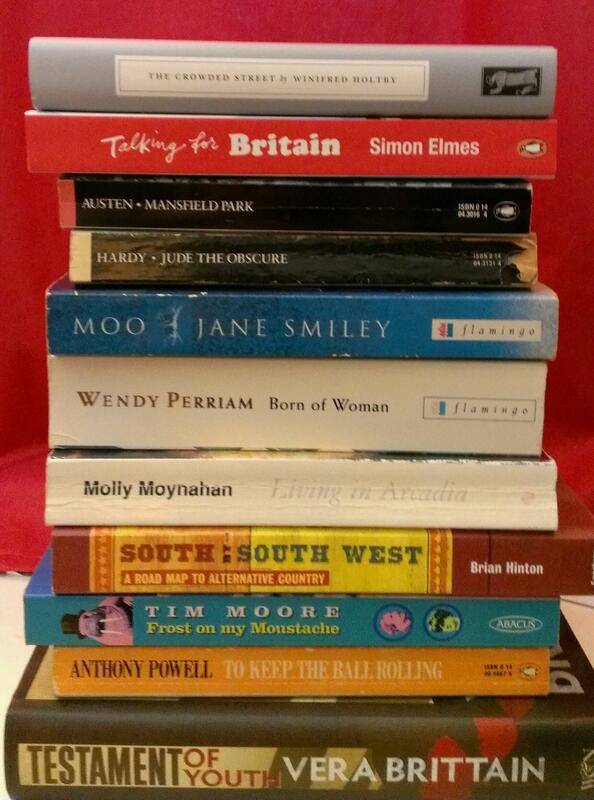 Simon Elmes – “Talking for Britain” – a survey of British regional language, received and read around 2006. This sits on the English Lang & Lit shelf outside the bathroom and was a late addition when I spotted it after making the pile shown above left. Jane Austen – “Mansfield Park” – I’ve done an Austen in each Month of Re-Reading, and as I have “Murder at Mansfield Park” coming up on the TBR, it seemed appropriate to take this one to read this time. Thomas Hardy – “Jude the Obscure” – handily this is the Hardy Project read for Jan/Feb, so reading this achieves two aims. At the beginning of the Hardy project, I wasn’t keen on re-tackling this one, but I’ve read all the books so far and got back into Hardy’s way of looking at things, so really quite looking forward to it now. Jane Smiley – “Moo” – I was reminded of this marvellous campus novel when discussing “The Art of Fielding“. Smiley famously writes in different genres and I’ve read most of her books, but haven’t re-read this one since I originally read it back in 1997, it seems. I’ve started this one today. Molly Moynahan – “Living in Arcadia” – this is another ‘woman breaks free’ road-trip novel. I selected it for last July but never got to it, so re-added it for this month. If I fail to read it again, I think that’s telling me something and it will have to go! Brian Hinton – “South by South-West: A Road Map to Alternative Country” – bought and read a while ago, I probably know more of the bands he talks about now. Tim Moore – “Frost on My Moustache” – his first travel book, where he travels to Iceland. I’m going there this year, so want to up my reading on the country. Anthony Powell – “To Keep the Ball Rolling” – his memoirs. As we read “Dance to the Music of Time” last year, this seemed appropriate! Vera Brittain – “Testament of Youth” – this will be my third read of this heartbreaking narrative of the effect of the First World War on the families and women at home. I remember sobbing over it last re-read, in my flat in Brockley. This is a beautiful edition gleaned from a set of books my friends Julie and Barry left behind with me for BookCrossing etc. when they returned home to Australia, and is being read to honour the 100th anniversary of the start of the War. Anyone else doing any re-reading this month? It’s not a proper challenge and you don’t need to do more than one, but I do recommend a hearty re-read! And do let me know what you think about the new blog title and shuffle around of the side menus … Happy reading! Slummocky is a great word, isn’t it. I (re? )discovered it when reading Stella Gibbons’ “Nightingale Wood”. To be slummocky is to behave in an indolent or careless way, and a slummock is a slovenly person. Now, of course, I’m NOT slovenly or careless or indolent. But I tell you what I have been doing, and that’s letting the admin slide. Not the invoices: no, of course not. I’m not actually stupid, and I would like my money to come in nice and regularly, thank you. And we all know that I run my accounts and do my tax return almost obscenely promptly every year. The basic principle of the bank reconciliation is that you go through your accounts and your bank statement, and make sure they match up. A bit like the old-fashioned practice of balancing your cheque book – and we all do it to some extent, I’m sure, popping in to check the bank account online and make sure there are no unusual or incorrect transactions. My friend Aly Mead at Silicon Bullet has written a great article on this subject; it’s particularly good to read the article if you do your accounts in Sage or a system like that. I run my accounts via a spreadsheet (which I do keep scrupulously up to date) recording invoices raised and paid on one sheet and payments and charges on another. Even though the entries aren’t quite in the same order, I have matched them all up, and the running total is the same for both. I pop the accounts spreadsheet into the same order as the bank account spreadsheet at the end (I do this by sorting the spreadsheet by that column) and the two should match up. If you do this every month, it’s simple. It’s like housework and ironing and all those other chores (actually, I never do ironing, but that’s probably for another time). I only have between 20 and about 35 transactions per month. Which is fine when it’s one or two months, not so great when it’s … erm … nine. The other thing I’ve been a bit lax about is moving payments from other places. I have a PayPal account and a few regulars and one-off clients pay me by PayPal. I used to withdraw each payment immediately to my bank account, so it created one line on my bank statement which matched at most one in and one out on my accounts spreadsheet. But I’ve let these build up before withdrawing, which means I’ve got one line on my bank statement which matches five or six sets of incomings and fees on my accounts spreadsheet. That will be changing, too. I wrote this article to remind myself how hideous it is doing your bank reconciliation if you leave it too long. It’s taken me a good few hours and given me a thumbing headache. Don’t be slummocky: little and often wins through! Do share any tips you have for making yourself do this stuff, by the way! I was looking at the Society for Editors and Proofreaders website and musing about how I almost never do work on paper manuscripts (once in well over 500 jobs), and then the doorbell rang and my new to do list stationery had arrived … so that’s one thing where I do stick with paper. Well, one of two things. With my to do lists, I have flirted with Google Calendar / Tasks and I do put meetings, events and appointments like Skype chats or phone calls in there. But all through my working life, I have had a paper to do list, and, you know what? That’s what I like to have. 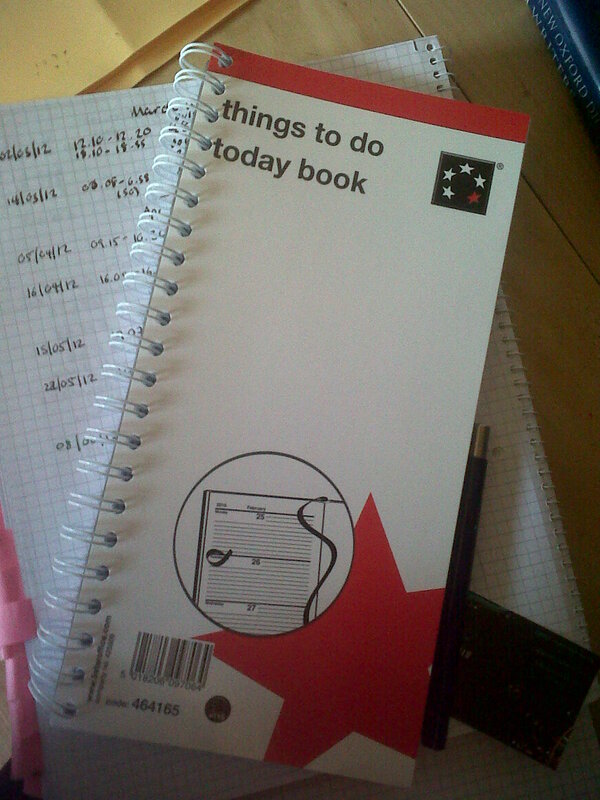 I had been using one of my few Libro notepads to keep it, but I’ve now bought a special book – appointments on the left hand page and Things To Do Today (why is that capitalised when the name of the book is all lower case, though?) on the right. With tick boxes and everything. There is also room for notes, which is handy for those phone calls. The other thing I keep on paper is my customer records. Not entirely: I keep a note of people’s pricing and other terms on their contact details in my gmail account. As I do work for people, I either create an invoice for that piece of work, including details of the time spent or word count, depending on how I invoice them, or add the project to their current monthly invoice But I have an A4 spiral bound book with a section for each major client and one for one-off/student clients. 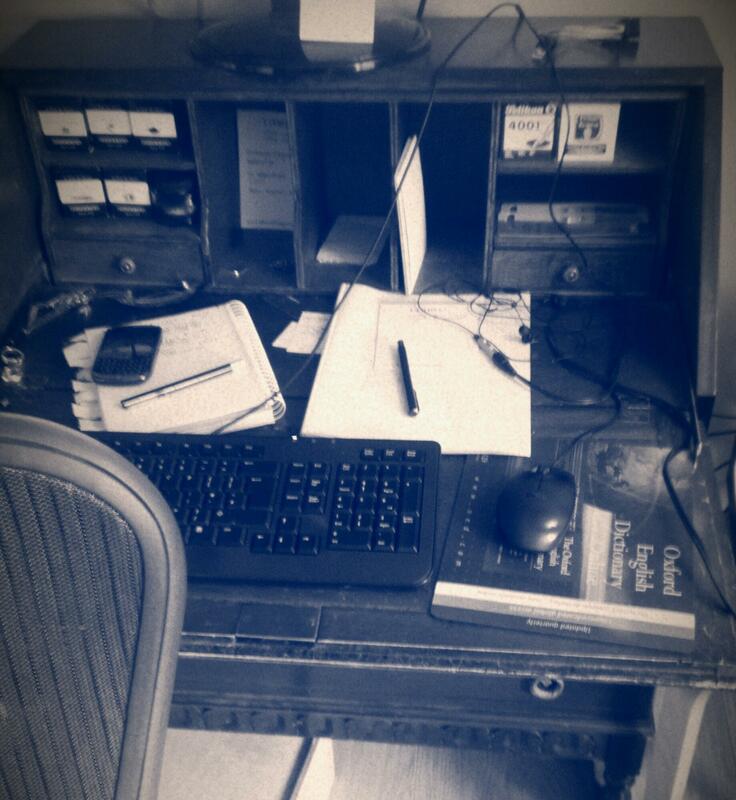 This is where I note down the date, time, word count and charge for each job I do. I like writing. I like pen and paper. I like using fountain pens with different colour inks. I might do all my editing, proofreading, writing and transcription on the computer, and I might have an online book review blog; I might even have a Kindle … but when it comes down to it, I read real books too (mostly, actually), write my book reviews in a nice notebook first, and keep paper records and to do lists. You don’t have to do what is most up to date and modern. Everything doesn’t have to be In The Cloud. Do what you feel comfortable with! Welcome to my personal blog about changing my life and running my business full-time. I started my business, Libro, in August 2009. I’d been doing bits and pieces of editing for people on an unpaid basis for years, and had lots of experience in various jobs, but it was when a colleague at the Library where I worked (full-time at the time) asked me if I could proof-read a couple of students’ dissertations that I decided to go for it, set up the company, registered with the Inland Revenue and went on an HMRC course to find out what to do. Since then, my roster of clients has grown; rather than work every hour of the day on both the day job and the business, I decided to go part-time at the Library, dropping one day a week in January 2011 and a further day in May. I’ve kept spreadsheets of how I’m doing against target, built up my customer base gradually, diversified so I now offer proof-reading, copy-editing, writing, typing, transcription and localisation, and I could see through November that it was time to make the big move and take the business full-time from January. So, I finish at the Library on 12 December (because of University General Holidays and some leave I had left to take) and then it’s Libro All The Way! I’ve started this blog because I want to record what it feels like doing this, and how it goes. I’m about to turn 40 and this feels like a really important time in my life. At the moment, it’s busy-busy-busy – TOO busy, really, and I want to take a few moments of reflection along the way. Some boundary setting: I won’t be talking about my clients by name or by identifiable features (so don’t worry if you’re reading this). I don’t know how often I’ll update it, so you might want to subscribe to the feed or just check back for new posts every now and then.